How Far is Shyam Gokul? Kumaraswamy Layout is one the most rapidly growing areas in Bangalore. Located on the Outer Ring Road, this area enjoys good connectivity with its neighboring areas. The area is easily accessible by Bangalore Metropolitan Transport Corporation (BMTC) buses. External & Internal walls of Solid concrete block work masonary, plastered on both sides. Durable and elegant surface cladding for lift walls. Marble / Granite flooring for lobbies. LED lights for common areas and landscape. Security cabin with intercom & CCTV camera. Vitrified Tiles flooring and skirting for living, dining and bed rooms. Anti skid vitrified tile flooring and skirting for Utility and Balcony area. Anti skid Vitrified/Ceramic tiles for flooring. Vitrified/Ceramic wall tiles up to false ceiling. Superior Quality CP fittings of reputed make. Vitrified tiles dado up to 2' height above the platform. Al windows with best quality hardware fixtures with mosquito mesh and safety grills. Main Doors : Wooden frame with both side teak wood finish shutters with best quality SS hardware fittings of reputed make. Internal Doors : Wooden frame and flush shutters with best quality SS hardware fittings of reputed make. Acrylic emulsion paint with roller finish for common areas. Durable texture paint for exterior areas. All internal walls and ceilings smoothly plastered with lime rendered cement mortar and finished with wall putty. Modular switches & sockets of reputed make. Main Switch Boxes: MCB & Other Electrical main fittings of reputed make. Power back up of 100% for common facilities and up to 1 KW for each apartment. T.V. points in living and Master bedroom. Telephone points in living area..
Centralised water distribution by hydro pneumatic systems. Thus ensuring uniform pressure across all apartments. Recycling and waste management are an essential part of our sustainable design. Organic waste converter is provided for this purpose and the manure so produced will be used for the landscape. Use of energy efficient lights - CFL/LED. Use of energy efficient pumps. 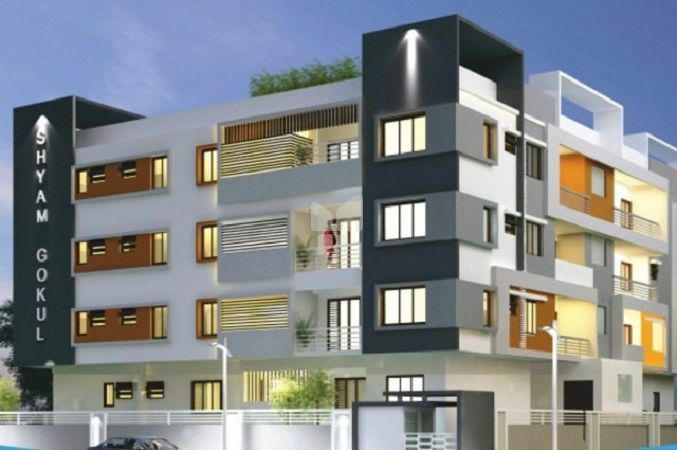 The Group has come along way in the field of polymer since its small beginning in 1977 with a negative capital, Shyam Builders is name that has become synonymous with the highest quality, excellence and innovation in the field of real estate development. We are proud of a spectacular track record in our chosen sphere of business and today, can be credited with changing the very face of the Banglore. Shyam Builders sensational world class apartments redefine the meaning of luxury. They are completed perfection and ready for you to move in. Shyam Builders specialize is very unique, giving each and everyone a class of high standard, living and reliability. Shyam Builders is known to reassuring peace of mind, transparency and professionalism. Shyam Builders has vast experience and we imagine, dream and believe in making a difference each day and act towards creating a wonderful world to leave in for our customers and their families.